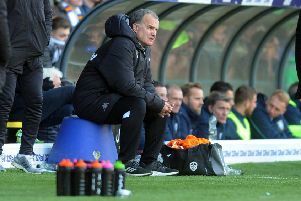 A strong second half display enabled Leeds United to make it five games unbeaten as they beat Rotherham United 3-0 to do the double over the bottom of the table Millers in front of another bumper Elland Road crowd. There were few signs of what was to come as a possibly complacent Whites side were held goalless in the first 45 minutes, but a hugely improved second half saw Leeds find the back of the net three times and hit the post twice to run out convincing winners in the end. Kyle Bartley got the ball rolling with his fourth goal of the season two minutes after the break and a double from Chris Wood, taking his tally up to 16 for the campaign, completed a fourth successive home win. Leeds boss Garry Monk surprisingly chose to play Pablo Hernandez in a central midfield role as he made three changes from the side that drew at Aston Villa with Wood back in the starting line-up and Bartley back in central defence in place of Liam Cooper. The attacking line-up did not quite work as Rotherham had the better of the chances in the opening half. As early as the fifth minute they showed their intent as Anthony Forde’s 20-yard free-kick was parried by home keeper Rob Green and Tom Adeyemi’s follow-up shot hit the post. Kemar Roofe saw his dangerous cross from the by-line deflected just over as United briefly threatened and Hernandez fired wide from 20 yards when under pressure as he got his strike away. But the final ball or cross was missing from the Whites’ play and it was the Millers who came close when Danny Ward’s low shot from distance was deflected wide. Izzy Brown then had a great opportunity when the ball came to him in space inside the area, but he shot over. Shortly after, Joe Newell was almost through only for Bartley to make a superb covering tackle. Souleymane Doukara sent a 20-yard shot well over and that was only Leeds’ second effort on goal in a disappointing first 45 minutes. Monk responded by putting on Ronaldo Vieira for the out of sorts Hadi Sacko with Hernandez put back in his more effective number 10 position and Roofe moved out onto the right wing. The response was almost instant as a corner was won and from it centre-back Bartley headed home Hernandez’s far post cross. The confidence suddenly flooded into the Whites’ play and Roofe raced onto Hernandez’s through ball only to see his cross just elude Wood in the middle. Former Leeds player Adeyemi got a header in for the visitors, but green was able to make a comfortable save. Leeds’ second shot on target brought their second goal as on 66 minutes Wood did well to control a ball into the box, chesting it down and taking another touch before firing a volley into the net to make it 2-0. Gaetano Berardi came within inches of adding another as he burst into the box only to see his shot bounce back off the post. But within a minute it was 3-0 when Wood met Roofe’s excellent low cross with a fine finish and at 3-0 the hosts could finally relax. There was little sign of a Rotherham comeback as in the previous meeting between the clubs a month ago with a Jon Taylor shot into the side netting their only response and it was Leeds who came close to a fourth when Hernandez’s low free-kick from 20 yard out hit the post with keeper Lewis Price well beaten. Leeds boss Monk acknowledged that his team had to improve after a poor first half. He said: “The first half was as poor as I’ve seen us in many months. We were playing into their hands, there was no urgency in our play or intensity and we were very lucky to come through the first half unscathed. “But we had a few words at half-time, we upped our pace and we scored three goals, hit the post twice and had three offsides that weren’t offside and would have led to chances. “All three goals were excellent and we could have come away with more. But that would have been a disservice to Rotherham. I thought they were good in the first half. “I’m happy with the result, I’m happy with the second half, but not the first, the players are aware of that. “We are a team that has to be at 100 per cent and in the second half we were much nearer to our best. We were much more clinical at both ends. “But three goals and another clean sheet we have to be happy – in the end. Leeds: Green, Ayling, Bartley, Jansson, Berardi, Bridcutt, Hernandez, Sacko (Vieira 45), Roofe, Doukara (Dallas 73), Wood (Antonsson 82). Rotherham: Price, Fisher, Broadfoot (Wood 84), Belaid, Mattock, Forde (Taylor 70), Adeyemi, Frecklington, Newell (Vaulks 76), Brown, Ward.